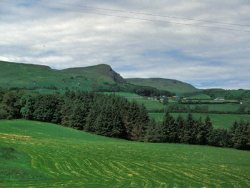 Scawt Hill, Co.Antrim: distant view from south. Calc-silicates associated with Tertiary dolerite plug intruded into Ulster White Limestone. Scawt Hill is described by Dr. J. Preston in Key Site 1130 - Scawt Hill, within the Igneous/Tertiary Block, though it is primarily a mineralogical site. As Dr. Preston states, Scawt Hill achieved international recognition through the research and publications of C.E. Tilley (1928-1947) on its newly discovered and rare calc-silicate minerals. High temperature, low pressure metamorphism of pure calcium carbonate rock with discreet bodies of silica impurity (flint nodules) has produced rocks containing larnite, spurrite and other unusual minerals, while assimilation of carbonate rock by the marginal dolerite has produced a sequence of pyroxenites of progressively more alkaline composition. Scawt Hill, Co.Antrim: from the south. The site is remote from surfaced roads and this has protected it from intensive sampling. Scawt Hill, Co.Antrim: south-east contact zone. 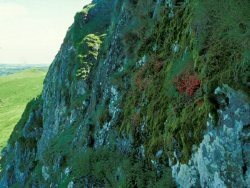 Exposures in the south-east gully are massive and difficult to sample: in fact, these outcrops are not accessible except to those with rock-climbing expertise. A thin tongue of metamorphosed limestone extends along the base of the dolerite crag above the grass-covered scree, and is cut by a dyke-like body of pyroxenite. In favourable light, these features can be observed from a distance. Calc-silicates can be found in situ at the top of the north-east gully, but these exposures are poor and less informative. 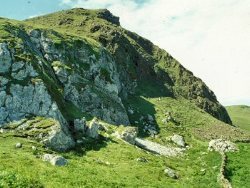 Scawt Hill, Co.Antrim: scree and north contact. The scree below the rock faces offers loose material of most rock types but 60 years of collecting have made samples of metasomatised flint nodules difficult to find. The present authors note that the availability of loose material has decreased markedly since the 1970s. Scawt Hill is eminently worthy of ESCR designation, but this is largely for its historical importance rather than its present value as an educational site. Indeed, visits by students or non-specialists should be discouraged, and only the most ardent, agile and well-equipped geologists would gain much from visiting the locality. In this respect, Carneal (Key Site 528) is a useful complimentary site worthy of designation. See also Key Site 1130 - Scawt Hill. 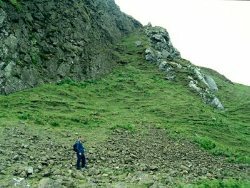 Management: Hill outcrop with scree material sensitive to collecting. Mainly of historical interest.